Christopher Best’s recent book, My Greek Barber’s Diary, is a biography of George Chronopoulos, told in the barber’s own words. In recent years, Best has been writing about history and people. Not celebrities but regular citizens who have made Canada a thriving multicultural country. His goal as a writer and as a publisher is to preserve precious memories. Best will talk about My Greek Barber’s Diary at the Isaac Waldman Jewish Public Library on March 2. The book follows Chronopoulos’ life from his childhood in Greece, through wars, hardships and immigration to Canada, to the modern day. Through the years, he has tried his hands at various business ventures, from restaurants to real estate, but he always comes back to being a barber. His hair salon has always been a hub of friendships and conversations, confidences and laughter. Chronopoulos’ bright, ebullient personality, his courage and insatiable curiosity to try new things, to learn new skills, attracted the young entrepreneurial crowd of the 1960s, ’70s and ’80s. Many of Vancouver’s industry leaders started out during those years, and many of them became Chronopoulos’ personal friends and golf buddies. My Greek Barber’s Diary is a series of more or less chronological stories as remembered by Chronopoulos. A large part of the book is dedicated to the barber’s extended family and their adventures. He sponsored many of his relatives into Canada and helped many others with their first jobs or first homes. A man of big heart, he also was one of the founders of the Gold Plate Dinner charity event in Vancouver in 1977, which was later picked up by the Hellenic communities all across Canada. Today, the events are considered the most important fundraiser in the Canadian Greek community. Chronopoulos talks in the book about the many people he got to know from different cultural and ethnic backgrounds. Among his many Jewish clients and friends are business tycoons and philanthropists Joe Segal, Bob Golden, Syd Belzberg and Max Fugman. Everyone first came to his shop because of Chronopoulos’ well-known talent for styling men’s hair, but they stayed for their barber’s charisma and the joy of his friendship. The book includes tributes to Chronopoulos, friends sharing their memories of good times and bad times together, of triumphs and losses. It took Best a year to record and transcribe Chronopoulos’ memoirs, and about six months to edit the book, which he published in 2015. My Greek Barber’s Diary is not Best’s first book. The writer owns his own publishing company, Warfleet Press, and, since 2007, has published eight books, all of them on local history, including one about Canadian Airlines. 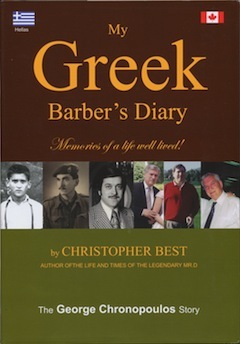 Best’s talk on My Greek Barber’s Diary at Waldman Library on March 2 starts at 7:30 p.m.